The Goddess Camunda, India Central Medieval. Pele, Hawaii’s goddess of volcanic fire, is a hag. Her skin is rough and black. She is a raging, destructive power. 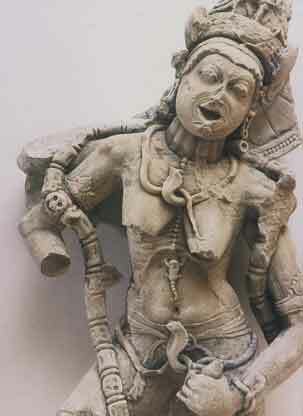 Camunda, an aspect of the Hindu goddess Kali, dances in the cremation ground, eating corpses. Her hunger can never be satisfied. In constant agony, she fills the world with her terrible cries. These are lesbian images, kindred spirits to all Raging (Lesbian) Feminists, patron saints of S.C.U.M. – the Society for Cutting Up Men. [i] Anger and vengeance are powerful, creative forces in lesbian responses to women’s oppression. Aspects of the gay and lesbian civil rights movement would have us forgo our fury. Dressed in suits and ties, acting like respectable people, we represent ourselves as innocent victims of unjust treatment. Our wounds are honored, but not our rage, hostility, and aggression. In contrast, the Queer movement of the 1990’s invoked the archetype of the Destroyer, vivifying lesbian and gay identity. The Queer Manifesto catches “the pure rage that most of us had learned to swallow,” Frank Browning writes. [iii] We subdue our anger in the everyday acts of our lives – dropping our lover’s hand when we turn the corner, murmuring at pictures of babies we are not allowed to play with, marking all the weddings and anniversaries that celebrate heterosexual privilege, carefully choosing where and when we are open about our evenings, our households, our friends dying in mid-life. Rage is energy that allows us to use queer identity as a profound interrogation of the straight world. If we are mad enough, we can see straight as every unexamined life that reeks of unexamined privilege. Straight is the preposterous designation of sexual difference and indifference that orders the meaning of everything, from apple pie to urban planning. We want to burn it down, shake it up, tear it to pieces. Like the Ancient Greek Furies, we are FURIOUS. We want justice, retribution, and torment for all who have offended us. Time after time, lesbian and gay people relinquish their rage. We keep greeting homophobia with gentleness, acceptance and love. At what cost? If we always only forgo our anger, we give away our power. Queer rage is what puts deviance back in sight. Anger lets us acknowledge how our passions twist and redirect the meaning of things. Instead of hopelessly affirming that we are ordinary people, we can use homosexuality to rage against the suffocating weight of ordinariness. Western culture represses consciousness of all the rage it generates; it has never honored the Destroyer. In Ancient Greece, the Olympian Gods banished the Furies – that fearful lesbian sisterhood with their taste for vengeance. [iv] Christianity would also resist or conquer the Destroyer, which is identified with the Devil and with Death. The dream of modern mental health likewise rejects destructive emotions: aggression, hostility, cruelty, anger, revenge, retaliation. These denied emotions return as the unacknowledged shadow, possessing personal and global relationships. Being queer means we can engage the archetype. By entering its mystery, we might assimilate its power, even while we loosen its grip. [i] Valerie Solanas wrote and self-published the SCUM Manifesto in 1967. It was reprinted in 1996 by AK Press, San Francisco and Edinburgh. [ii] quoted in Frank Browning, 1994. [iv] see Aeschylus (525-456 BC), The Eumenides.